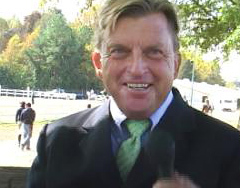 Danny Robertshaw is a United States Equestrian Federation “R” licensed judge and serves as a committee member for both US Equestrian and the United States Hunter Jumper Association. To date, he has judged the Devon Horse Show and the Washington International three times each. His judging resume includes the National Horse Show at Madison Square Garden and the Maclay Finals. Training hunters for over four decades, Danny has piloted some of his era’s most celebrated show hunters to championships. He guided hunter Protocol to Championships at Devon, Harrisburg, Washington, Madison Square Garden and the Royal Winter Fair all in the same year. He trained and rode successful hunters Lestat, Parody, Silent Running, Bib N Tucker, Classified, Rainbow Bridge, Harvard Yard, Prince Montocello, Arc De Triumph, Hummel and About Face (to name a few), earning championships at the Devon Horse Show, Harrisburg, Washington and/or the National Horse Show. He also earned championships at Devon, Harrisburg, Washington, and/or the National Horse Show with such hunters as Lestat, Parody, Silent Runner, and numerous others. In 2001, Robertshaw received the USEF’s Emerson Burr Trophy as the year’s Equestrian of Honor for the Hunter division, and in 2010 the United States Hunter Jumper Association gave him the Lifetime Achievement Award. Robertshaw and fellow hunter trainer Ron Danta operate Beaver River Farm in Camden, South Carolina and also train out of Wellington, Florida. Together they run a canine rescue (http://www.dannyronsrescue.org), caring for abused and neglected dogs until they are ready for adoption.